The back bumper on the Buick has been bent since the day I got it. Bent in an arch shape, it just didn’t look right. I’ve seen this same problem on many 1960 Buicks to some degree. Even on restored cars! Just a weakness of the design I suppose. Anyway, I assumed that the bumper was pretty stout and that straightening it would take some serious torque, probably beyond what I can do myself. 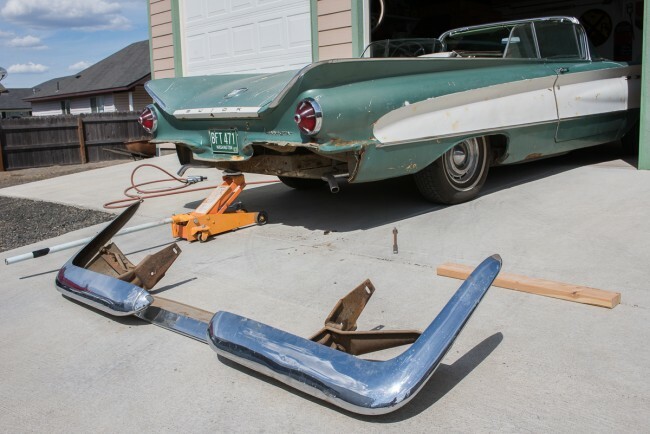 I had considered taking the bumpers to a chrome shop to just have them straightened (but not re-chromed… yet). But the other day I thought “what the hell?” and removed the rear bumper. Turned out to be pretty easy to remove with just four bolts, which all came loose with little effort. I had a jack ready to catch the bumper, so it wouldn’t just fall to the ground. Then I set the bumper up on a few blocks of wood and stomped on it with both feet! It was surprisingly easy to bend it. A few good stomps in key locations, and even a little twisting by hand, and it came right around! It looks a LOT better… not perfectly straight, but a heck of a lot better! I think there’s a more complex bend going on which is why my efforts didn’t get it back to 100%. For now though, this is satisfactory. If I had known how easy it was to do, I’d have done this ages ago! I Bet I spent a hour on the whole job, tops. Next I’ll try the front bumper. The peak is pushed upward a bit. Hey Dave, any updates on this boat? Summer’s about over! It still runs and drives… had fun with it all summer! Dave, I just posted on Craigslist in flint, MI a brand new n.o.s. rear bumper with n.o.s. back up light housing. Email me if interested, I believe this is the only one left which is n.o.s. brand new in the country. Thanks Paul, very nice find! 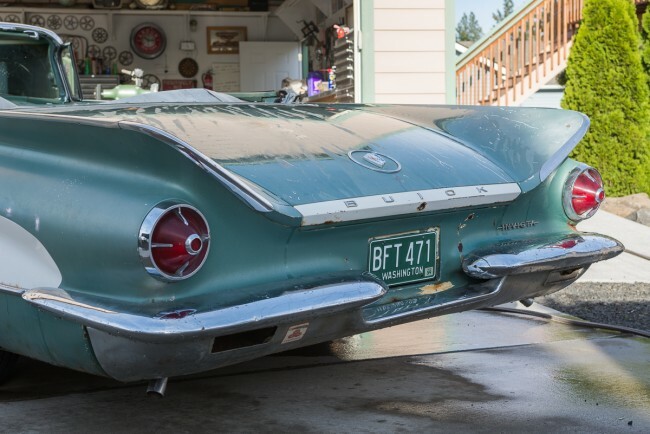 Can’t afford it at the moment, but I did post the link to the 1960 Buick group on Facebook. Howdy. I just found this site surfing the web and am enjoying the posts. I just purchased a 1960 Invicta convertible a few weeks ago. Looking forward to making my way through the site. Regards, Christian. Hey, no updates?? 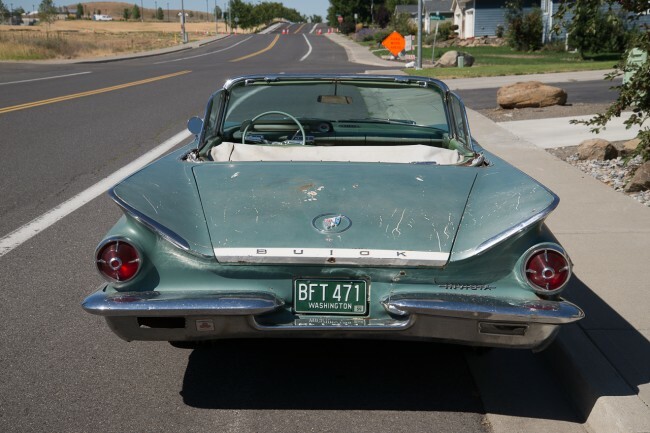 What’s happening to your 1960 Buick?? Will get getting it out of hibernation soon! I have a new muffler on the way, some new top weatherstrip and am shopping for a new top. Will post updates!